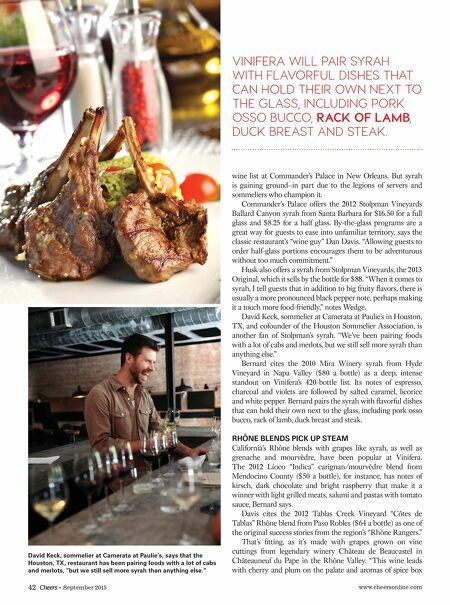 www.cheersonline.com 42 • September 2015 wine list at Commander's Palace in New Orleans. But syrah is gaining ground—in part due to the legions of servers and sommeliers who champion it. Commander's Palace offers the 2012 Stolpman Vineyards Ballard Canyon syrah from Santa Barbara for $16.50 for a full glass and $8.25 for a half glass. By-the-glass programs are a great way for guests to ease into unfamiliar territory, says the classic restaurant's "wine guy" Dan Davis. "Allowing guests to order half-glass portions encourages them to be adventurous without too much commitment." Husk also offers a syrah from Stolpman Vineyards, the 2013 Original, which it sells by the bottle for $88. "When it comes to syrah, I tell guests that in addition to big fruity flavors, there is usually a more pronounced black pepper note, perhaps making it a touch more food-friendly," notes Wedge. David Keck, sommelier at Camerata at Paulie's in Houston, TX, and cofounder of the Houston Sommelier Association, is another fan of Stolpman's syrah. "We've been pairing foods with a lot of cabs and merlots, but we still sell more syrah than anything else." Bernard cites the 2010 Mira Winery syrah from Hyde Vineyard in Napa Valley ($80 a bottle) as a deep, intense standout on Vinifera's 420-bottle list. Its notes of espresso, charcoal and violets are followed by salted caramel, licorice and white pepper. Bernard pairs the syrah with flavorful dishes that can hold their own next to the glass, including pork osso bucco, rack of lamb, duck breast and steak. RHÔNE BLENDS PICK UP STEAM California's Rhône blends with grapes like syrah, as well as grenache and mourvèdre, have been popular at Vinifera. The 2012 Lioco "Indica" carignan/mourvèdre blend from Mendocino County ($50 a bottle), for instance, has notes of kirsch, dark chocolate and bright raspberry that make it a winner with light grilled meats, salumi and pastas with tomato sauce, Bernard says. Davis cites the 2012 Tablas Creek Vineyard "Côtes de Tablas" Rhône blend from Paso Robles ($64 a bottle) as one of the original success stories from the region's "Rhône Rangers." That's fitting, as it's made with grapes grown on vine cuttings from legendary winery Château de Beaucastel in Châteauneuf du Pape in the Rhône Valley. "This wine leads with cherry and plum on the palate and aromas of spice box VINIFERA WILL PAIR SYRAH WITH FLAVORFUL DISHES THAT CAN HOLD THEIR OWN NEXT TO THE GLASS, INCLUDING PORK OSSO BUCCO, RACK OF LAMB, DUCK BREAST AND STEAK. 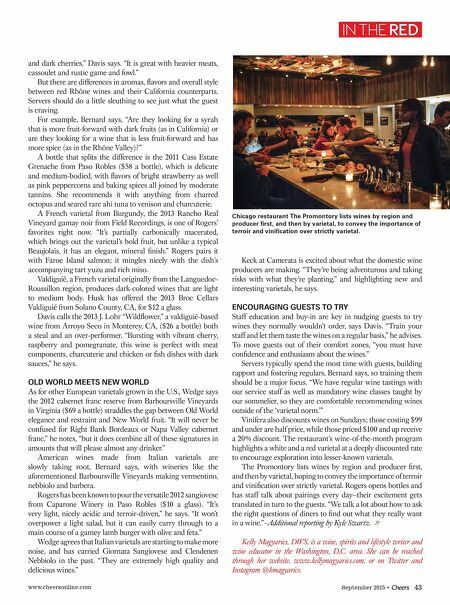 David Keck, sommelier at Camerata at Paulie's, says that the Houston, TX, restaurant has been pairing foods with a lot of cabs and merlots, "but we still sell more syrah than anything else."